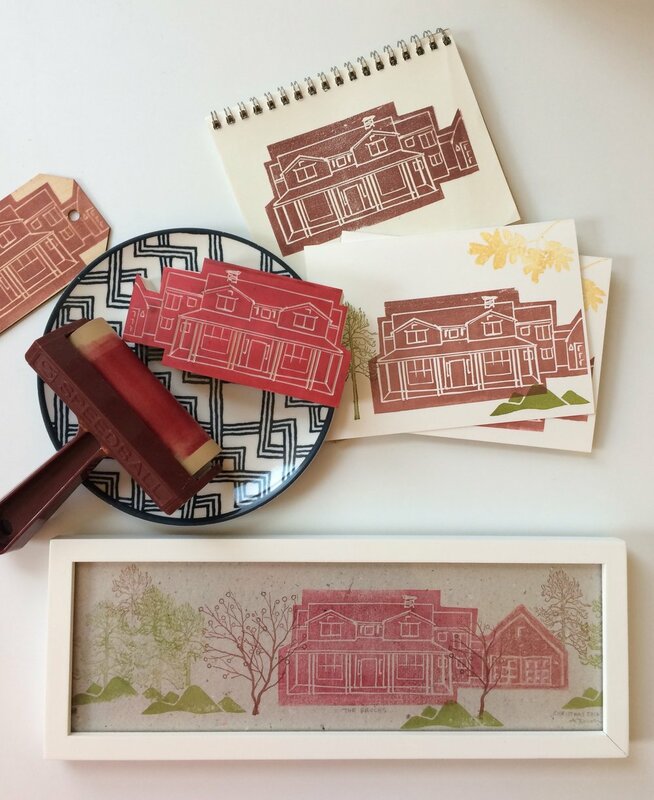 Hand carved depiction of house, custom packet includes framed print and collection of hand stamped greeting cards - my latest artistic projects. After many years in San Francisco, I am excited to bring my creative eye and unique designs to New England that showcase my easy sense of style with functionality at the forefront. I believe Design is a huge swirling realm of life, open to everyone and full of potential to bring beauty, calm, comfort and stimulation to us all. If you see the world through the lenses of space, color, light and texture, Design is all around us; It is important, influential, giving and personal. No stranger to the smell of sawdust and the clap of subfloor footsteps, walking a job-site is my favorite part of what I do (and a lot of how I grew up! )...not because every project has to start from scratch, but because the process, effort and talent that a team of people put into such a project, is extraordinary and fills me with awe every time. I have an eagle eye for detail and tiny design decisions. Put together, they make up a whole bedroom, family kitchen...an entire house! Walking the path to create a home for yourself and/or your family can be a winding journey. I can help in that process. - As and Interior Designer, I look to create contemporary, functional, and colorful interiors full of energy and beauty, while allowing for each home owners' taste and personal style to shine through. I emphasize the importance of timeless materials and am able to work within each clients budget, from multi-million dollar new builds to thousand dollar updates. - As a Wallpaper Hanger, I continue to learn this meticulous craft though also bring years of bookbinding, skilled craftsmanship and a professionally trained eye to each project. I have trained with extraordinarily talented hangers, some of the best in the industry, and understand if takes a lifetime to become a master hanger. I find the work incredibly rewarding and have all kinds of patience that hanging requires! - As a Stylist, I meticulously gather, edit, and compose any array of accessories, products, or objects for various creative uses and venues and particularly excel at creating beautiful still-life scapes and vignettes, good for interiors, temporary installations or photoshoots + print copy. Event Design is a real joy and I thoughtfully curate a feel, an experience for such occasions, and like interior projects, personalize my approach to reflect clients' vision. - As an Artist, I continually look to learn new skills, mediums and gather artistic experience with great respect for the process, focusing on pattern, color, and texture in my own work. I believe anything can be hung on a wall. And one day, I WILL have my very own open white and bright studio with hardwood floors covered in bits of colorful paper, paint splats and wood shavings. Began + opened Studio Allie Llc, upon moving to CT from CA, in winter of 2013, jumping in full throttle with a new construction 5,000 square foot home in Groton, CT. 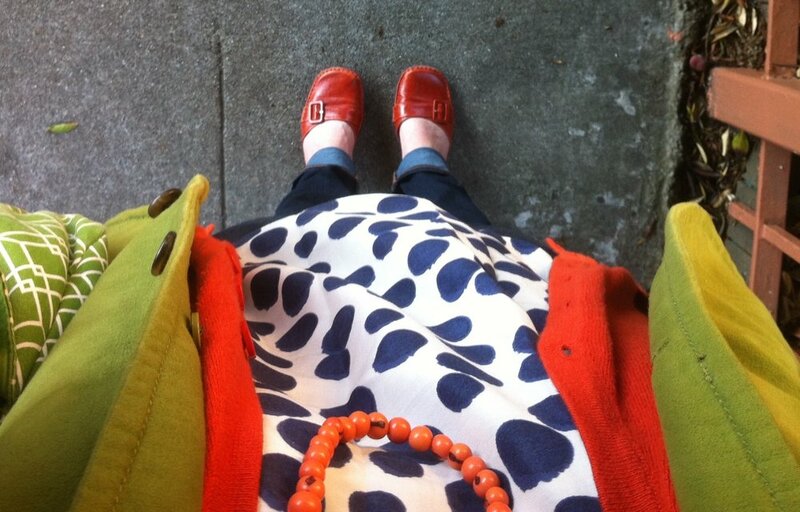 Previously in SF, CA (design mecca!) - 5 years as Associate Designer + Buyer for Lotus Bleu Design duo with owner Jeannie Fraise, helping to grow our reputation + clientele, and “ones to watch” fanfare to fruition! We were awarded by California Home + Design Magazines, “Best ID for 3,000+sq ft” for 2012, secured the first main Madeline Weinrib rug account on west coast, and participated in the renowned local decorator showcase house. Over 12 years specifically in Interior Design, spanning project scope, complexity, style and budgets. Over 16 years in design + art retail store management, visuals, space planning, window design and original installations amongst several of the top shopping districts of San Francisco Bay Area, including Hayes Valley, Fillmore Street, Chestnut Street and Berkeley’s 4th Street. Lifetime of personal exposure, interest and skills in construction, craft, art, photography + love of pattern and textiles. Master’s degree, Interior Design, SF State University 2001. Bachelor’s degree, Theology + Athletics, Bates College 1996.